Carlos Gaviria, a native of Cali, Colombia began his musical education at the Conservatorio Antonio Maria Valencia. While in Cali, Carlos joined the Orquesta Sinfonica del Valle, where he spent three seasons performing as a bass section member. Carlos came to the United States on a scholarship to study at the University of North Texas, where he completed the B.M. and M.M. While at UNT, he worked as a teaching assistant to the world-renowned bass teacher Jeff Bradetich. He is currently a doctoral candidate in double bass performance at the University of Houston, where he studies with Dennis Whittaker. Carlos is currently a member of Symphony of South East Texas and has performed regularly with many ensembles, including the symphony orchestras of San Angelo, Abilene, Irving, Plano, University of North Texas, and University of Houston. He also has been a member of festival orchestras, including the AIMS orchestra in Graz, Austria, and the Texas Music Festival Orchestra. As a music theorist, Carlos’s areas of research include the music of Alberto Ginastera. He published a thesis on the use of the guitar chord by Ginastera and gave a lecture on the topic at the Latin American Composers Conference in 2009. Carlos is a dedicated pedagogue and was active as a bass instructor in the Dallas and Houston areas for several years; many of his students have been placed in All-State orchestras and have gone on to be accepted into music programs at major American universities. He has taught at the Abilene Summer Music Festival and at the Bradetich Annual Summer Bass Camps since 2009, and he has presented master classes at UNT and UT Panamerican. Additionally, Carlos has taught music theory and ear training classes at the University of North Texas and the University of Houston. He currently resides in Houston, where he maintains a full private teaching studio. 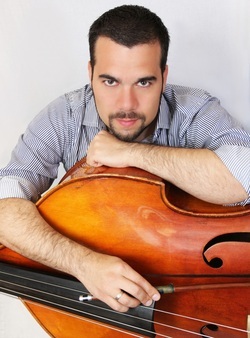 Carlos joined the faculty of Stephen F. Austin University as bass instructor and theory instructor in 2012.